Unplug Your Kids theme for last week was White. As this was my first time I was a little nervous, but we all had fun so we'll definitely keep it up. We sang Popcorn Popping while the popcorn was popping. 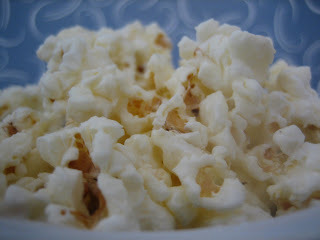 Recipe: Just make some popcorn and add as much or as little melted white chocolate as you like. Leave it to set. I leave mine in the fridge which makes it go hard. 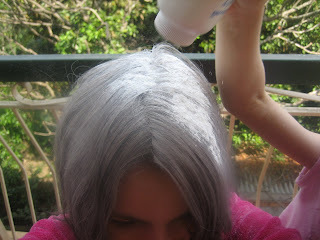 White Hair Petal (not my daughters real name btw) had fun putting talcum powder in my hair. 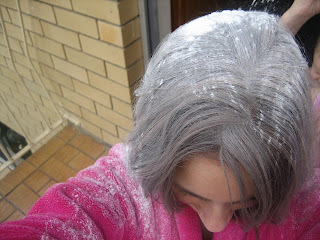 Funny really as i'd spent a lot of money and 2 hours at the hairdressers on the weekend to cover up my white/grey hair! She didn't really want to have her hair done. In the end I did it but it didn't turn out well since she has blondish coloured hair. Petal got crazy toward the end but it was all good. We laughed a lot doing this. 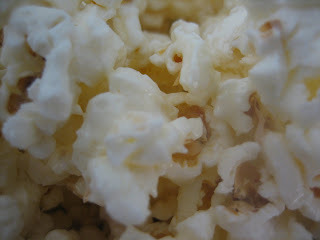 All I have to say about the popcorn is yum and I am going to have to try it. Thanks. I love the hair project to. My kids would be laughing so hard at it. Once I get an air popper (Santa, are you reading this?) I'll have to try chocolate corn. How cute! It looks like this might be a "goofy moment to remember." Welcome to Unplug! What a fun mom - doing silly and yummy projects! welcome to the challenges - aren't they fun! So many great ideas to be had. Thanks everyone. Your comments have given me a boost. I was sure no-one would interested in our projects, would other mothers subject themselves to the talcum powder? But it's all in good fun (and education of course! )Looking forward to the next challenge!